That may sound like a little local difficulty. But the tensions created by unemployment, marginalised youth and incompetent governments are far from exclusively Hellenic…. …Events in Pakistan and India have brought geopolitical risk back onto investor’s radar screens. They should now also be thinking about social risk. The events, which were “sparked” by the police shooting to death 15-year-old Alexandros Grigoropoulos in Exarchia, Athens, on Saturday, December 6, then erupted into full scale rioting in Athens, across Greece with at least 11 cities seeing protests and several schools and at least two universities taken over, and has now moved into London and Berlin where Greek diplomatic missions have been the targets of capture by protesters. 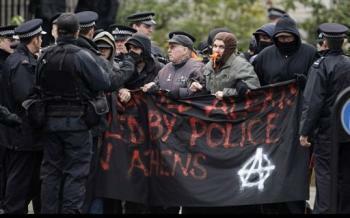 Anarchists have been at the forefront of this action. The government of the right wing New Democracy Party, under Prime Minister Kostas Karamanlis, is in jeopardy. Like its Conservative counterpart in Canada, it has barely been able to keep a grip on power (the Canadian government has a minority of seats in parliament, while the Greek government has a one seat majority), and has also been pursuing neoliberal policies that have deepened inequality. What seemed to be provoked by what even the Greek interior minister believes was an unjustified shooting of a youth, has mushroomed into a large scale social protest. The Greek Communist party announces a mass rally in central Athens for tonight and the socialist Pasok opposition calls for peaceful mass demonstrations. University professors start a three-day walkout and many school students stay away from class in protest. Cars and pedestrians return to the streets of Athens as Greeks go back to work, but with a 24-hour general strike scheduled for Wednesday against pension reforms and the government’s economic policies, many Greeks fear the demonstrations could last for days. See the timeline of events on The Guardian. More news from The Guardian on this, the third day of protests. 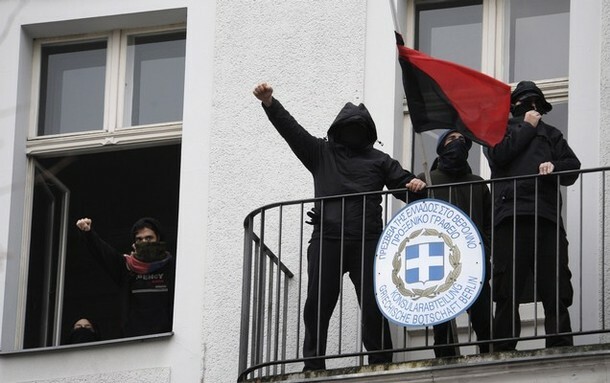 See also “Anarchists’ Fury Fuels Greek Riots,” The Christian Science Monitor, Dec. 8. See the impressive photo gallery of the protests on the Sky News website. Where I am writing from, in Montreal, a similar police shooting of a 17-year-old boy, Freddy Villanueva, in a predominantly immigrant neighbourhood with many Latin American and Caribbean families, also led to violent protests against police, with riots and the torching of police cars and businesses on August 9 (see the photo gallery). That case also continues to be at the centre of controversy, with no plausible or acceptable answers provided by the Montreal police as to why one of its men murdered a young and unarmed boy at close range. Indeed, police brutality is itself the target of annual demonstrations by students and others, and ironically sometimes the police show up to prove the point made by the protesters. Everywhere, as economic crisis deepens and political crises erupt, we will see the true face of the police state that is the modern nation state. Yeah, well…, now the European Union will be bilked for another few hundred million, to prop up a country where few really work and produce anything, but many demand everything. If, after a trial the police officers involved are deemed to be guilty of an offense, they should go to gaol, just like any other criminal. Similarly, if, after a trial, any rioter is found to have hurt someone, or caused economic damage, they should be sentenced accordingly. As to the Communist Party, I bet nobody here has ever lived under Communist rule. Well, I have, and believe me, if Greece had a Communist government, not only such riots would be immediately quashed, but there will be no coverage of any incidents. Interestingly, the kind of repression you describe is what Greece had, but under a right wing military dictatorship. The Communists have long had a very popular base of support in Greece. And we are talking about democratically elected socialist governments, right? Voters have a right to them if they choose them? Anyway, I appreciate your visit and your comment, which seems to have come only moments after the post went up. Repression is repression, regardless of which direction it comes from, or even whether it’s supported by a majority of the electorate. The National Socialists in Germany won popular elections, and had wide support, too. Democracy, while far from perfect, works well in the long term, as long as there are immovable safe-guards of minority rights. A good measure is, how well the rights of (non-violent) expression of the most publicly unpopular opinions, are secured. The greatest atrocities in history are often perpetuated by “true believers.” As they say, the road to Hell is paved with good intententions. To the victims, it is irrelevant if they come from Communist, or Fascists, or Utopians, or the Spanish Inquisition or the Taliban. This is why, I never want to see one group or party hold all the reins of power, no matter how much I personally like them, or how strongly I agree with them. Because, ultimate power does ultimately corrupt. Anyway, I won’t hijack your blog with my ramblings, but I do appreciate and thank you for your open-mindedness. Well, I fully agree, and it would be hard not to. I am definitely not a ‘dictatorship of the proletariat’ enthusiast, as much as I have sympathies for socialist thinking, I have to maintain some critical distance. Many thanks again, your comments were appreciated. Thanks AkitvmembeR21, the situation you describe is in fact how many, even conservative media, describe the situation of many young Greeks today, both in Greece and in the rest of Europe. The actions of the police, there and everywhere else where they behave with such brutality, are never acceptable. What it does tell us is that the police serve *against us*.